KFC is giving away a free Watch with every Kids Meal bought. Valid as of 10 April 2015. 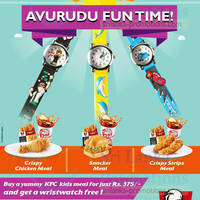 Are you ready to have fun with KFC this Avurudu Season? Buy a yummy KFC Kids meal for just Rs. 375 and get a wristwatch free! Fill in the coupon and get a free ice cream cone. Handover the completed coupon at your nearest KFC to redeem the offer.